Fresh squeezed Ambrosia apple juice – is there anything better? How about if you make it at home for a fraction of the cost of store bought? Juicing gained popularity over a decade ago and many wellness experts still advocate for it as a great health practice. Simply put, it’s a great way to get a lot of nutrients into the body quickly. However, there’s one barrier – the actual juicing process. Some people find it intimidating but it doesn’t have to be. There are several options when it comes to juicing; cold pressed juicers (aka masticating), centrifugal juicers or blending and straining. Each one has its pros and cons. These machines are the newest entry into the juicer category and many would say the more advanced option. Sometimes referred to as a masticating juicer, this type of juicer first crushes the fruits and vegetables and then extracts the juice. Because there are no spinning metal parts, it tends to keep the juice cool in the process. The benefits to this type of juicer are that it has a higher yield of juice and it maintains more nutrients in the process. The downside is that these juicers tend to be on the more expensive side. This is the most common option and there are plenty of different styles and brands to choose from. While these work quickly, they do heat up the fruit a little in the process and that breaks down the enzymes and increases the oxidization. This ultimately reduces the nutrient content. The other criticism of this option is that not all of the juice is extracted so there is some juice wasted. Plus, the clean up can be time-consuming but this differs from model to model. Most people already own a blender and don’t think of using it for juicing. Surprise, it can be a great way to get the benefits of juicing without the cash outlay (or counter space sacrifice) for another kitchen appliance. The downside is that the process is a little more involved, with the need to prepare the fruit before blending, and to strain it afterwards. However, some people prefer this method because it allows them to keep more pulp in their juice, thereby increasing their fibre intake. 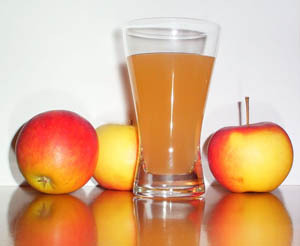 Whichever method you chose to make your fresh Ambrosia apple juice, have some fun and get creative. We love to add a dash of cinnamon or nutmeg to give it a little more kick. Or, you could increase the nutritional value by adding vegetables like celery, carrot, kale or beets – they all go superbly with Ambrosia’s sweet flavour.